Let’s see if I can come up with a post every day of the rest of the offseason. 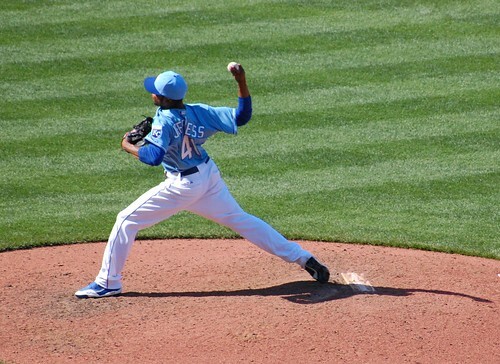 Today, there are 41 days left until Opening Day on April 1.
was Jeremy Jeffress’ jersey number when he was a Royal, and before that, when he was in Milwaukee. Jeffress was acquired as part of the trade that sent Zack Greinke to the Brewers. By the middle of last season, when Jeffress was back down in Omaha, I had mentally written him off as another one of those pitchers. He throws hard, and walks a lot of guys. Wooo. He’s a Blue Jay now, so it doesn’t much matter for our purposes, but last summer I did hear a couple of scouts* talking about him one night. Both still believed that Jeffress has a career as a late-inning guy in the Majors. *neither scout worked for the Royals or the Jays, for the record, though I don’t remember what teams they did work for. The Jays’ site has Jeffress listed as number 33 now. I wonder if that was his preference, or if he wanted to keep 41. No Blue Jay has that number right now, so I wonder why he had it through two different teams. I remember when Mike Moustakas made it to Omaha in 2010. Greg Holland was wearing Moustakas’s number 8 at the time, but quickly switched numbers to give Moose the 8. I asked Moose what he did to get the number from Holland, and he just laughed and swore he’d never tell. To this day, I wonder.